The wet and wonderful exhibit in the Sussman Environmental Center at the Children’s Museum (212 West 83rd Street), features hands-on interactives and cool, colorful graphics. Dynamic H2O dives into NYC’s water supply system, which delivers about 1 billion gallons of water each day to more than 9 million New Yorkers. 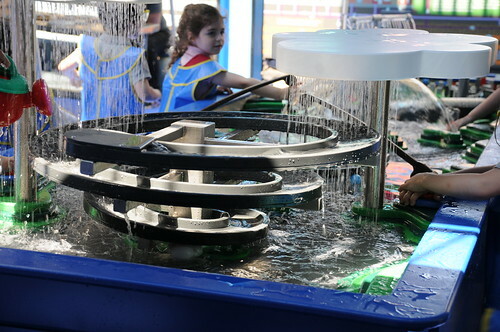 The exhibit features a 16-foot interactive water table that enables children to investigate the path of NYC’s water as they play and explore. The experience begins with the water cycle up in the clouds. With the press of a button, children become rainmakers. Small floating droplets allow them to follow the currents as they progress downstream. Continuing along the stream, there are many hands-on opportunities for fun and discovery. Children can experiment with flow, pressure, and even plumbing! As the water reaches the city, children can build their own city from Lego Blocks. Additional features include an interactive NYC building designed to help children understand how gravity and pumps are essential in providing water to houses and skyscrapers across the city. Magnetic tubes that can carry water allow visitors to create the aqueducts and tunnels that transport water from watersheds to New York City and understand the roles that people play to help design and construct systems that deliver a plentiful supply of clean water. Children are challenged to piece together enough pipes to span the “100 miles” from the Catskills to the city. Other special features are outdoor laboratories where children can enjoy inquiry-based exploration, assuming the roles of some of the people involved in maintaining NYC’s water resources, including marine biologists, ecologists and other scientists. A wide range of educator-led workshops will take place throughout the exhibit’s run. Participation is free with admission.